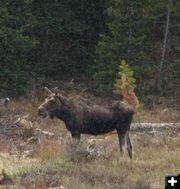 Pinedale Online > News > May 2006 > Green River Lakes Road is open! Canoeing the Lake The road is open to the lake and boat launch area. Campground closed The campground is expected to open around June 15th with services (water, garbage). Note that there are no showers, power or phones at this campground. Also, cell phone reception is marginal to unavailable in the campground. Log decks Decks of logs should be removed soon. Mountain Pine Beetle Mountain Pine Beetles have killed many of the trees in the Green River Lakes Campground area. Logging in the campground Logs are decked near the main road and there are still slash piles and debris in the campground area. Trails open The trailhead parking area and trails around the lake are open. Green River Lakes Road is open! What a difference two weeks makes! We checked out the Green River Lakes road on Saturday and it is now open all the way to the end. * Road in is graded and in good condition. * Side roads are dry and there are many paces for dispersed camping. * Green River Lakes trailhead and lake access areas are open. * Green River Lakes campground closed until June 15th. * Overnight parking allowed only in trailhead parking area right now. * Expect to encounter logging activity on the road as loggers finish up last year's tree removal timber sale. * When the campground opens, fee will be $12/night, with a stay limit of 10 days. Group area can be reserved through Reserve USA. Other campsites are first-come, first-serve. * Mosquitos are starting to come out. The trail access to the wilderness is open and free of snow for quite a long ways. We ran into Dave Bell coming out from a long hike, and he commented that he went nine miles in on the Green River Lakes trail and didn�t run into any snow. The warm temperatures last week made a big dent in melting a lot of the snow at the lower elevations between 7000 to 9000 feet. The Green River Lakes Campground is currently closed and the road into the camping area gated closed while tree removal operations are in effect. The Forest Service expects the logging debris to be cleaned up and log decks removed and the campground reopened by about June 15th. When the campground opens, there will be water and garbage services, and a fee will be charged for overnight stays. The campground area is closed for public safety reasons until the logging debris is removed. 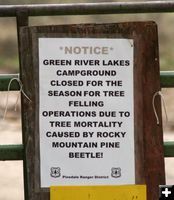 Many of the trees in the Green River Lakes campground area have been infested with Mountain Pine Beetle, which have killed a lot of the trees. This is a problem the Forest Service has been dealing with in the campground area for several years now, with chemical spray treatments, pheremone deterrants and now logging to remove dead and infected trees. The logging has opened up a lot of the stand in the campground area, and some of the camp spots now have nice views of the lake and Square Top Mountain. Once the tree removal is all done, we think folks will like the more open views. There still is plenty of privacy between camp spots with many full 8-10 foot young trees coming up to replace the mature trees that have been taken out. The Forest Service is trying to keep as many trees as possible in the campground, but it looks to us to be somewhat of a lost cause. Many of the remaining trees are whippy lodgepole pine that just don�t have the trunk strength to withstand much wind without the protection of the other trees around them. We suspect it won�t be long before many of the �leave� trees will also be coming down, either by wind throw or just determined to be a safety hazard with a bit more time. The road through the campground to the boat launch access is open and accessible. No overnight camping is allowed in the boat launch parking area. The road into the campground is currently gated off and signed as �closed for the season�, so at present there is no camping allowed in Green River Lakes campground. All overnight parking is being directed to the trailhead parking lot. 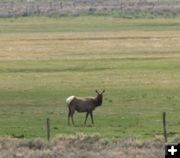 There are plenty of dispersed camping areas all along the entire Green River Lakes road. If you come prepared with your own drinking water so you can dry camp, the campground closure won't stop you from camping in the area. The Green River is running pretty high and muddy with the spring run-off flows. The fishermen we talked with said they weren�t having much luck getting bites in either the river or the lake, but it really didn�t matter. The scenery is beautiful and it�s a gorgeous place to be, whether out in a boat or fishing from the bank. Whiskey Grove Campground road is free of snow and all the camp spots are accessible. The Green River is flowing extremely high, deep and fast past the campground, but not overflowing the banks. We do not recommend this campground for families with small children due to the close proximity of all the campsites to the river and the high, fast flows of the water at this time. The Union Pass road has opened up as far as the eye can see from the Green River Lakes road. We didn�t drive it to see how far the road is open this trip, but judging from snow still visible up on the side hills, we�re fairly certain you don�t have to go too far to run into snow, and it�s not open all the way to the top or over to the Dubois side yet. Photos by Clint Gilchrist and Dawn Ballou, Pinedale Online! Green River Moose People can't go in the campground area, but this moose can. Purple Phlox Phlox are in bloom in colors ranging from white, to light pink, to deep purple. Green running high The Green River is running high with spring runoff. Flooding along the Green The Green River has overflowed its banks in several places with the high flows. Dollar Lake Snow drifts can be found in some places, but are melting fast. 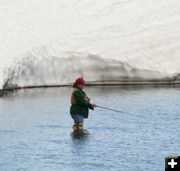 Here, a fisherwoman enjoys Saturday at Dollar Lake. Whiskey Grove Campground Whiskey Grove Campground is open, but the river is running very high nearby. Green River near Whiskey Grove The Green River is very high and flowing fast near Whiskey Grove Campground. Union Pass Road The Union Pass Road has opened up in the lower elevations. Trails are open Trails are free of snow in the lower elevations. The high trails along the Continental Divide still have snow. Aspen are leafing out Aspen are getting their leaves. The Place-Green River Guest Ranch is open for the summer season. They offer guided fishing trips, float & wading trips, 4-wheeler and cabin rentals, horse rentals, pack trips and restaurant services. 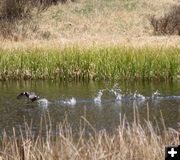 Waterfowl The marshy areas along the Green River Lakes road are a bird watcher's paradise! Homestead Elk An elk grazes on spring green grass just across the Green River.